Interactive Information Designer at Facebook, Lee Byron has updated his blog stating that the largest social network on the planet Facebook has launched a major update to its mobile website. 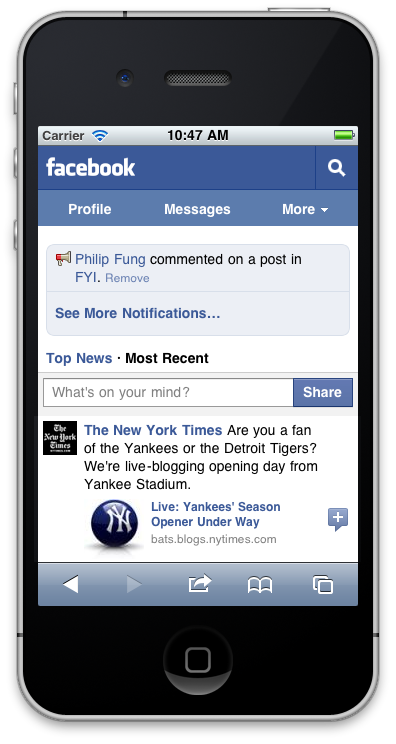 Facebook has now launched a ‘Unified’ Mobile Website for Touch Screen phones and other smartphones. Earlier, Facebook had two separate websites: touch.facebook.com for Touch Screen Phones and m.facebook.com for other mobiles. But from today forward though, m.mobile.com will be the only mobile version of Facebook, writes Mashable’s Ben Parr. ya its really we can easily open social networking sites on mobile phone. and face book has launch a major updates to its mobile web sites. <a href="www.mobilebooth.co.uk">mobile phone accessories</a>vistt www.mobilebooth.co.uk.